The dramatic story of Lady Hester Stanhope â?? a wilful beauty turned bohemian adventurer â?? who left England as a young woman, unashamedly enjoyed a string of lovers and established her own exotic fiefdom in the Lebanese mountains where she died in 1839. Ambitious, daring and uncompromising, Lady Hester Stanhope was never cut out for a conventional life. Born into an illustrious political dynasty, she played society hostess for her uncle, William Pitt the Younger. After his death, she struck out for unchartered territory, setting sail with her lover for the Mediterranean and Constantinople â?? turning her back on England, as events would transpire, forever. It was in the Middle East, however, that she found her destiny. As the greatest female traveller of her age, she was the first western woman to cross the Syrian desert, where she was hailed by the Bedouin as their â? ?Star of the Morningâ??. From her labyrinthine fortress in the mountains of Lebanon, where she established what amounted to her own fiefdom, she exerted a canny influence over the region's devious politics. Hers was a life of adventure and intrigue â?? yet in the years following her death her remarkable story has been largely dismissed, reworked by the Victorians into a cautionary tale for young women with wayward tendencies. This captivating biography, drawing on fresh research from three continents, resurrects Hester as the complex, courageous and fearless woman she was, bringing to life her hidden loves, friendships and ambitions. More than a mere traveller, here was a woman whose aspirations led her straight to the heart of the shadowy race for influence between the great powers of the nineteenth century â?? a world of shifting alliances, double agents, romance, intrigue and murder. 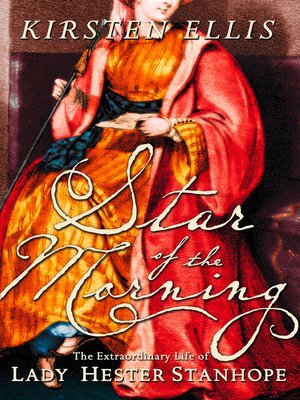 Above all, Lady Hester Stanhope was a woman driven by her desire to make a mark on the world, whose search for love and spiritual meaning in a war-torn Middle East provide an illuminating and moving parallel for our time.